Click chart for more in-depth, interactive market data. It's a perfect storm in India. Stocks have been in free fall this month, the rupee has been hitting record low levels and investors are running scared. The Mumbai Sensex index swung wildly on Wednesday, at first popping into positive territory but then falling by 760 points to close with a loss of nearly 2% for the day. 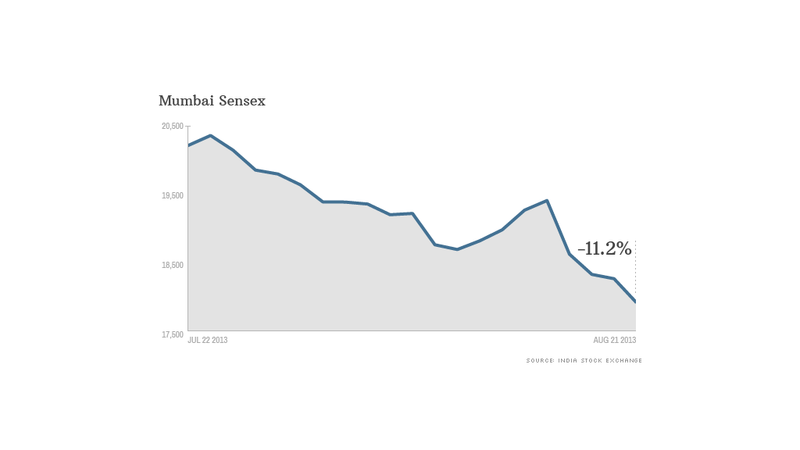 This is the fourth consecutive day of losses, with the index down by 7.5% over the period. In the past month, the benchmark index has tumbled by just over 11%. Investors are growing increasingly concerned about the U.S. Federal Reserve cutting back on its massive bond-buying program, which has generated a wave of liquidity around the world and propped up global markets. As the Fed looks to taper its $85-billion-per-month stimulus program, emerging markets -- and India in particular -- have suffered damaging capital outflows. Local factors are making the situation worse. Investors are losing faith in India's sluggish economy and worry about its large current account deficit, which reflects the nation's tendency to import more goods than it exports and leaves it heavily reliant on foreign capital. The economy grew at its slowest pace in a decade in 2012 and forecasters have been downgrading their expectations for future growth. "There is no dynamism in India right now that will allow the free flow of capital," said Stephen Pope, managing partner at Spotlight Ideas. Pope pointed to the extreme bureaucracy, which is slowing economic and political progress. "Everything seems to make some progress and then it stops because of the level of bureaucracy. And this is what is killing the potential of India. It should be challenging China, but it's not," he said. Others have voiced concerns that elections due by May 2014 will do little to strengthen India's political leadership. "Whatever new coalition assumes power by next spring will be very weak, deepening India's political paralysis and reducing already paltry chances for reforms needed to re-energize the lagging economy," said David Sloan, director for Asia at Eurasia Group. Investors are selling the rupee, pushing the currency on Wednesday to a record low versus the U.S. dollar. Economists and traders said the sell-off was exacerbated by indecisive moves from the Indian central bank. The Reserve Bank of India announced Tuesday that it would inject over $1 billion into the markets, just days after saying it was working to tighten liquidity. The announcement came after yields on Indian government bonds spiked above 9%. "It's taking neither a hot nor cold stance to protect its currency and this indecision is fueling the market's selling bias when it comes to the rupee," said Kathleen Brooks, a research director at FOREX.com. Ishaq Siddiqi, a market strategist at ETX Capital, said the central bank was doing little to secure stability for the Indian economy and currency. "This is seen as a sign of desperation from the Reserve Bank of India," he said.